Mary and Joseph, pray for us. 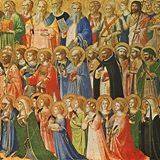 Michael and all angels, pray for us. Anna, Joachim, Elizabeth, pray for us. Elijah, Moses, John the Baptist, pray for us. Isaac, Sarah, Abraham, pray for us. Jacob, Joseph, Samuel, pray for us. Ruth, David and Solomon, pray for us. Isaiah, Jeremiah, pray for us. Peter, Paul, Andrew, pray for us. 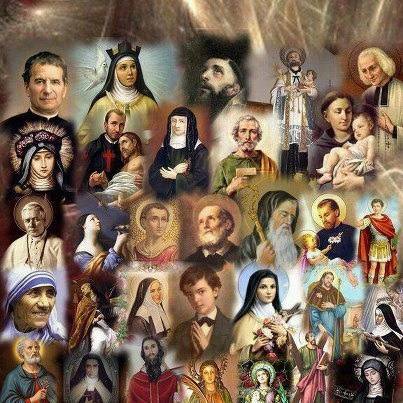 James, John, and all apostles, pray for us. Mary Magdalene, Veronica, pray for us. Barnabas, Matthias, pray for us. Stephen, Philip, and Cornelius, pray for us. Prisca and Aquila, pray for us. Timothy and Titus, pray for us. Linus, Cletus, and Clement,pray for us. Lawrence and Chrysogonus, pray for us. Innocent, and Boniface, pray for us. Hippolytus and Origen, pray for us. Athanasius and Basil, pray for us. Felicity, Perpetua, pray for us. Cosmos and Damien, pray for us. John, Chrysostom, and Justin, pray for us. Lucy, Agatha, and Agnes, pray for us. Jerome and Eusebius, pray for us. Scholastica and Benedict, pray for us. 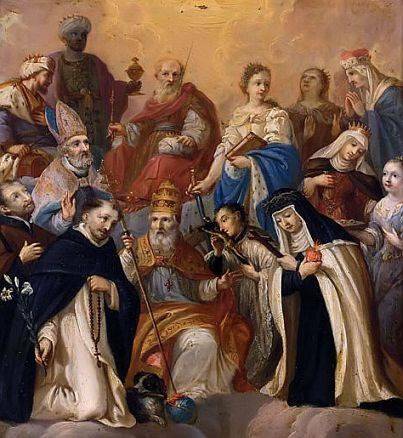 Ambrose, Monica, Augustine, pray for us. Martin and Gregory, pray for us. Clare, Francis, and Dominic, pray for us. Francis Xavier, Ignatius, pray for us. Elizabeth and Catherine, pray for us. Louis and Wenceslaus*, pray for us. Lord, be merciful, save your people. From all evil, save your people. From every sin, save your people. From everlasting death, save your people. By your incarnation, save your people. By your death and resurrection, save your people. By your gift of the Spirit, save your people. Have mercy on us sinners, save your people. Christ, hear us. Lord Jesus, hear our prayer. Lord, give new life, hear our prayer. To these chosen, hear our prayer. By the grace of baptism, hear our prayer. O Jesus, Son of the living God, our prayer. Send your Spirit, hear our prayer. In its fullness, hear our prayer. On your sons and daughters, hear our prayer. Who believe and profess you, hear our prayer. Copyright © 1987 by OCP Publications, Portland, OR, 97213. All rights reserved.